By Trevor McIntyre: The management for heavyweights Daniel Dubois (10-0, 9 KOs) and Joe Joyce (8-0, 8 KOs) are making it clear that it’s all systems go in a match-up for the British heavyweight title. The BBBofC ordered the Joyce vs. Dubois fight for their British title, and both fighters say they want the contest to happen. Dubois’ promoter Frank Warren says he wants the fight to happen, as does Joyce’s manager Sam Jones. Now we’ll have to see if the fight can be made. Dubois, 21, will be fighting next month against Richard Lartey (14-1, 11 KOs) on April 27 at the Wembley Arena in London, UK. Joyce, 33, recently captured the World Boxing Association Gold heavyweight title, which makes him one of three champions with the WBA. It’s only a matter of time before the WBA orders Joyce to face WBA Super World heavyweight champion Anthony Joshua. Joyce would be taking a risk in facing Dubois, but it would be one that could pay off big time if he beats him in an impressive fashion. 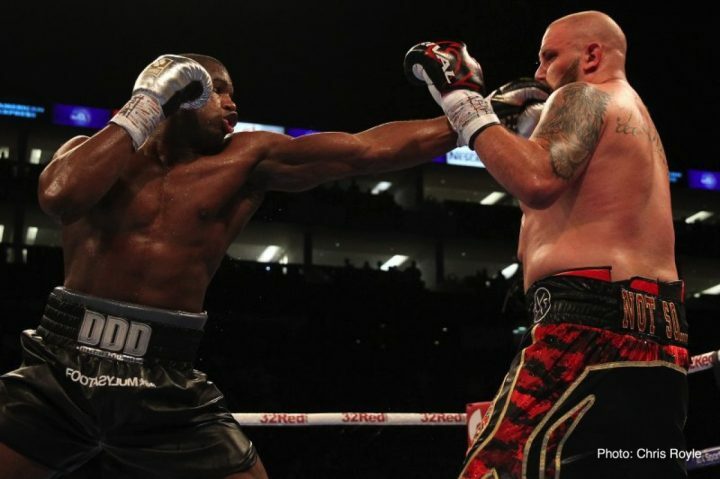 The 2016 Olympic super heavyweight silver medalist Joyce could see his popularity increase considerably in the UK if he destroys the young Dubois. As you can see, Warren is interested in making the Joyce vs. Dubois fight. We’ll soon see if Warren is serious about making the fight happen. A lot of boxing fans are predicting that Warren will steer the 21-year-old Dubois to safer waters, and keep matching him the way he’s been doing since he turned pro by putting him in against guys like Lartey, Kevin Johnson, Razvan Cojanu and Tom Little. Joyce, 6’6″, is a much different fighter than those guys. Given the way that Dubois has been matched since he turned pro in 2017, it’s hard to predict how he’ll perform in getting in the ring with a fighter with heavy hands, a great engine, and the athletic skills of Joyce. It could turn out to be bad for Dubois, who is easy to hit and not particularly fast of hand. “As you all know, Joe Joyce is a man of few words, but when I turned my WIFI on in mid air yesterday, I had a very small and blunt message from him, saying, ‘Make the F—–g fight happen. So let’s see how serious they are. Joe is mandatory for three major titles now!” Joyce’s manager Sam Jones said on his social media on Friday. It’s an excellent way for Joyce and Dubois to have their popularity increased overnight by fighting each other in 2019. It’ll be harder for Joyce, 33, to come back from a loss than it would be for the younger 21-year-old Dubois. If Joyce loses, he would have an uphill climb in trying to rebuild from the loss at a ripe age. Dubois is young enough to come again, and he’ll be back to where he is right now in a couple of years. No one would blame Dubois if he were to lose to Joyce right now. Dubois doesn’t have the Olympic experience than Joyce has, and he’s basically having his amateur career as a pro.